Today I started class by making some points about their Gattaca responses--most of them had some revision to do. I had thought about just giving them credit so they could move on to the next assignment without revision. Decided against it. I want all of their work to be quality work. Nothing just for credit. Same thing went for their cancer prevention assignments. A few had been turned in, so I had seen that they need to go for more depth on their explanations and use of reliable references. So I touched on that as well in my daily de-briefing. Then I introduced our new +Starr Sackstein-inspired system for setting goals and self-grading for the next assignment (the discovery of DNA). I told them they would grade themselves afterwards and I would only change it if I felt they had over or underscored themselves. And they worked steadily for the entire first period... and most of the next. The first to drop off and disengage did so a full hour and a half into the two-hour period. That's 75% engagement. And that was the minimum. And that was 1.5 hours of fairly steady, largely self-directed work. Couldn't expect more form a room full of full-fledged adults like myself. No threats. 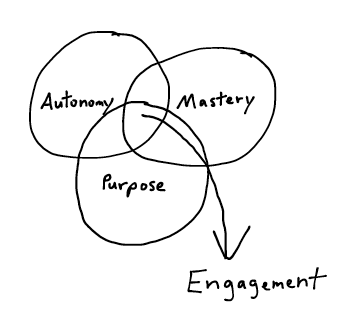 Just autonomy, mastery, and purpose. I moved from group to group, discussing cancer, their projects, people we knew who were affected, discussing what it means to explain how something prevents cancer, discussing nutrition, a mix of student-initiated and me-initiated conversations. As he finished his project near the end of class, one student asked, "Do plants get cancer?" "I don't know," I said, "maybe when they get those growths--burls on them. Maybe that's cancer, but I don't know." He opened a chromebook to find out. He reported back later, excited: "Yes, they can get cancer, but it doesn't spread like it does in humans, because their cells don't move." And that... that is what it's all about. Why am I surprised this works?